FNT takes Miami for the first time, partnering with local music powerhouse iii Points. 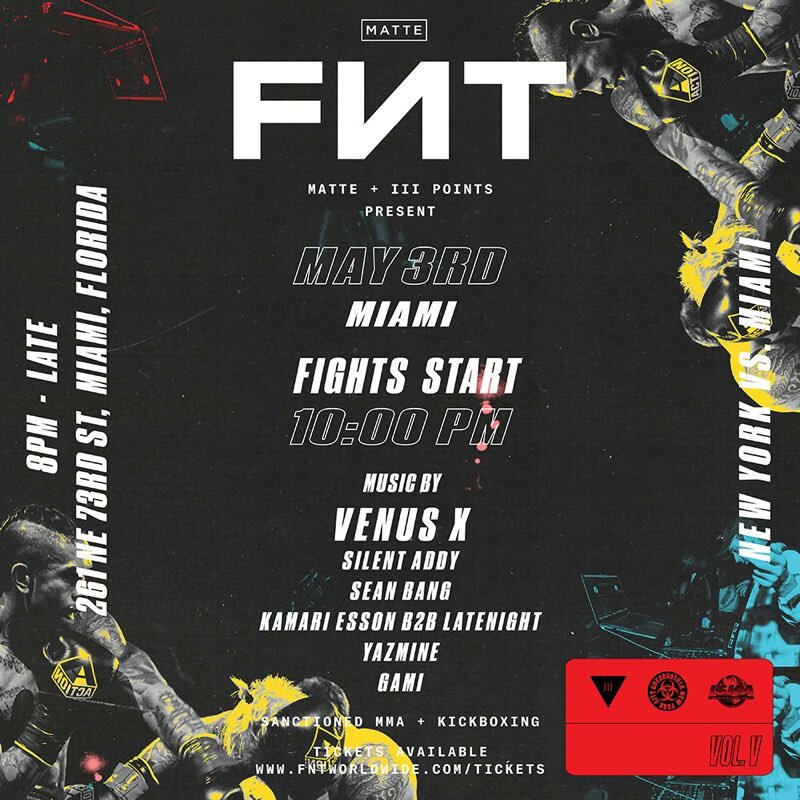 After two consecutive sold out shows in New York and Los Angeles, FNT is bringing its unique blend of combat sports, music and nightlife to Miami’s Little Haiti neighborhood. Invading the raw warehouse space of Lemon City Studios, New York brawlers are fired up to compete with the best Miami has to offer. With music provided by some of South Florida’s premiere DJ’s, Venus X, Silent Addy, Sean Bang, Kamari Esson, B2B, LTENGHT, Yazmine & Gami. Begun as an illegal fight party in a Soho storefront, FNT has since grown out of its roaming roots and become a unique live entertainment that has attracted high profile fans such as A$AP Rocky, Alexander Wang, Martha Hunt and Hanne Gaby Odiele. Planning to develop into a global league, FNT is poised to disrupt the fight industry from the ground up. A-Trak, Flipp Dinero, Maliibu MiitchThutmose and Jadakiss. Immediately following the Miami premiere, FNT returns to Los Angeles on Wednesday, June 21 and will continue to expand throughout the year. It’s a party. It’s a fight. April 12, 2019 by CITRUS Staff.